What’s On For Oktoberfest This Year! Oktoberfest puns are the wurst, so we're sticking to the facts for this year's guide to Oktoberfest in Brisbane. Don your lederhosen fellas, and get braidin' ladies, because Oktoberfest is back in town, and we're excited. Here's our guide to the best Oktoberfest events in Brisbane. Ranked among the ten most authentic Oktoberfest festivals in the world, Brisbane's Official Oktoberfest is the place to go if you're after complete cultural immersion. As Australia's largest German festival, we're talking cowbells, leg-slappers, a Miss Oktoberfest Competition, and loads of German fare to mun(i)ch on. Oktoberfest is quite the sausage fest', what with all the authentic German brats and blatwursts on offer. The food is a major selling point of any Oktoberfest celebration, but it's not all schittys and sausages. At this year's festival you'll find delights from the German Sausage Hut, King of Cakes, K&K Schnitzel and Burger Haus, Haxen Haus, and the Organic Cotton Candy Company. If you're not content with lazing in the Munich beirgarten, you can get competitive in the Bavarian Strongman of 2014 comp, cheer on the Miss Oktoberfest clash, and watch as the title of Beardmeister is handed down to the best beard in Brisbane. The Bavarian Oktoberfest Band, flown direct from Munich, will be providing the entertainment, as well as authentic German dancers, cowbell ringers, and Yodellers. What about the beer? Sorry, beir? Hand-crafted German beers might be the name of the game at Oktoberfest, with three flagship beers on offer made just for this Oktoberfest festival, as well as bang-on replicas of Bavaria's finest steins to drink them from, but if you're not a fan of the amber ale don't despair, there's a host of other beverages to whet your whistle with. As well as non-alcoholic beer, softies, coffee, tea, and the like, there's also an impressive section of award-winning German still and sparkling wines (wein?). Not just for the grown ups, Sunday is family day at Oktoberfest, with a Kinder-zone for kids to experience a taste of Germany, with a petting zoo, puppet show and face painting. Eagle Street Pier is getting the Munich touch for Oktoberfest this year as Bavarian Bier Café celebrates all month long. The festivities include special Oktoberfest menus and biers, food challenges, and live music. The bier on offer for October includes five Munich-brewed official Oktoberfest biers—this stuff is the real deal. Tasting flights are on offer so you don't have to miss a drop. There's a special Oktoberfest menu on for the month, including German delicacies like roast pork, kraut, and potato dumplings, giant pretzels, schnitzels, sausages, ribs, and Kaiserschmarrn (that's a caramelised pancake with roasted almond and rum-poached raisins). Bavarian Bier Café have embraced all that is fun about the German festival, with daily competitions, like Giant Pretzel Throwing, Wednesday Night Stein Hoisting & Holding, and Thursday Stein Races to keep the fun up all through October. There's even a 1kg Wednesday challenge where you're invited to take on a 1kg pork knuckle with mash and sauerkraut. Tame the beast, and you'll score a ½ Litre Oktoberfest bier to wash it down. When: Throughout October, visit their website for all the details. Like this? 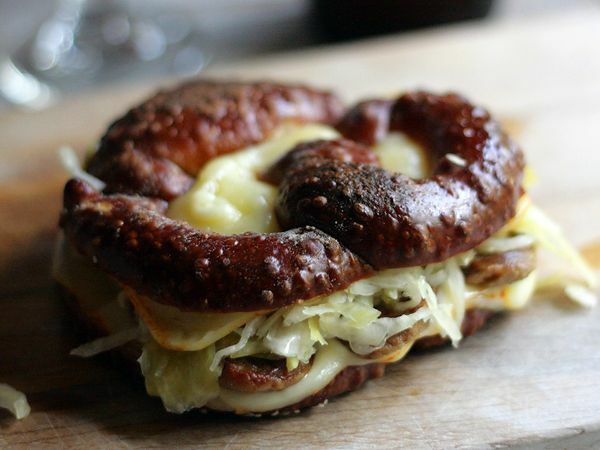 You'll love our list of Brisbane's best German restaurants!